As you might know, the 4th Eastern Economic Forum was held in Vladivostok on September 13, 2018, led by the Russian President Vladimir Putin. It saw the participation of the Chinese President Xi Jinping, the Japanese Prime Minister Shinzō Abe, the South Korean Prime Minister Lee Nak-yeon, the Mongolian President Khaltmaagiin Battulga and other officials. The Mongolian President Khaltmaagiin Battulga arrived in Vladivostok on September 11 and plunged into the work of the Forum straight away where he had rather fruitful bilateral negotiations with Vladimir Putin, Xi Jinping, Shinzō Abe and other participants. On September 11, the Japanese Prime Minister Shinzō Abe paid a visit to the Mongolian President. It was their second encounter at the Eastern Economic Forum. Shinzō Abe supported the initiatives of his Mongolian counterpart and discussed with him the operation issues of the recently built New Ulaanbaatar International Airport in the Khöshig Valley in the vicinity of Ulaanbaatar that is currently at the opening stage. The Japanese Premier also advocated the development of tourism by specific planning, increasing the meat import from Mongolia and, naturally, the development of cooperation in ensuring security in the region. On September 12, the Presidents of Russia and Mongolia exchanged their opinions on a wide range of issues of their bilateral cooperation to the fullest extent. They expressed their mutual satisfaction with meeting in the Far East again and emphasised the great significance of such meetings for intensifying their bilateral cooperation. During their meeting, K. Battulga mentioned his suggestion made in 2017 on resuming the 1993 Agreement On friendly relations and cooperation between the Russian Federation and Mongolia and signing it for an indefinite period of time. He also discussed the issue of activating the interaction between the 2 countries’ National Security Councils and suggested adopting a revised cooperation plan concerning the regional security. Battulga said that Mongolia was analysing the opportunity for building a port in the Far East and was preparing certain appropriate offers to that effect, including the initiative for creating a joint working group for activating the implementation of the Mongolia – Russia – China Economic Corridor establishment programme. 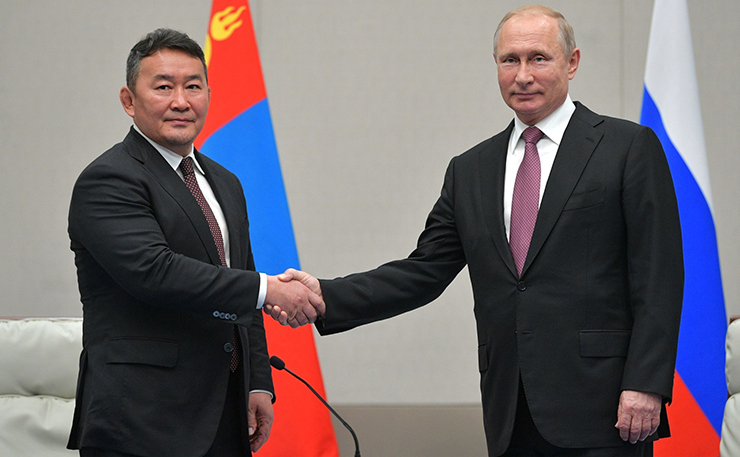 Furthermore, the Mongolian leader expressed an idea for cooperation in organising an electrical super network in Northeast Asia and handed the study of the economic feasibility of this initiative over to Vladimir Putin. Vladimir Putin expressed his satisfaction with the positive development of the Russian – Mongolian relations in all the areas and reiterated his commitment to the further activation of the bilateral cooperation in the spheres of agriculture, railways and defence. The Russian President Vladimir Putin reaffirmed his support of building a gas pipeline from Russia to China via Mongolia which Mongolia worked hard to achieve for many years at all the 4 trilateral summits between Russia, Mongolia and China, as well as at other forums. One may consider that this marked the greatest achievement of the negotiations that took place here, especially, for Mongolia, since the coming gasification of Mongolia is to resolve the issues of air and water cleaning and heating for the ger districts in Ulaanbaatar. The parties agreed to celebrate the 80th anniversary of the Battles of Khalkhin Gol in 2019, organise a joint exhibition, produce a feature film and a documentary and publish a book. K. Battulga invited V. Putin to visit Mongolia for the celebration next year. On September 12, the Mongolian President K. Battulga also met the Chinese President Xi Jinping who participated in the Eastern Economic Forum with a big delegation for the first time. During the negotiations, the Mongolian President K. Battulga advocated building an electrical super network in Northeast Asia, developing the cooperation in building the trans-Mongolian gas pipeline, implementing the projects for establishing the Mongolia – Russia – China Economic Corridor and made a number of concrete initiatives, in particular, on increasing the export of agricultural products, mainly meat, to China. Xi Jinping supported these suggestions and expressed his willingness to cooperate proactively in the trade and economic sphere in order to make the balance of trade between the 2 countries increase from the current $6.7 bn to $10 bn by 2020. The issues of cooperation in the areas of railways, processing industry, ensuring the security in the region, etc. were discussed. Battulga was invited to pay an official visit to China on the occasion of the 2nd summit of the Belt and Road Initiative in the first quarter of 2019. The leaders of the 2 countries exchanged opinions concerning the event organisation issues in the framework of the coming 70th anniversary of the establishment of diplomatic relations and the development of frontier cooperation in October 2018. Apart from the meetings of the state leaders, K. Battulga had one with the Russian Minister of Sport Pavel Kolobkov. The Russian and Mongolian parties exchanged their experience in promoting mass sports and national sports development. They also discussed the issues of the preparation work Mongolia needs to do for holding the 7th Children of Asia International Sports Games in 2020 that have been held under the patronage of the International Olympic Committee and the UNESCO every 4 years since 1996. These competitions were held in the Republic of Sakha (Yakutia) as it was the originator of the idea. The Children of Asia International Sports Games are a large scale project that requires a very responsible approach. For instance, in 2016, about 3,000 young athletes from 36 countries took part in the competitions. “We are willing to provide consulting for Mongolia in organising the competitions,” said P. Kolobkov. As we can see, the Eastern Economic Forum has become a platform for new encounters and rapprochement between the Presidents of Russia, Mongolia and China, and the negotiations between them gave a new impulse to the development of not only bilateral, but also trilateral cooperation.